Each month 12 million people use Elsevier’s ScienceDirect platform. The Mendeley social network has 4.6 million registered users. 3500 institutions make use of ClinicalKey to bring the latest in medical research to doctors and nurses. How can we help these users be more effective? In this talk, I give an overview of how Elsevier is employing data science to improve its services from recommendation systems, to natural language processing and analytics. While data science is changing how Elsevier serves researchers, it’s also changing research practice itself. In that context, I discuss the impact that large amounts of open research data are having and the challenges researchers face in making use of it, in particular, in terms of data integration and reuse. We are at just beginning to see of how technology and data is changing science, correspondingly, this impacts how best to empower those who practice it. Paul Groth is Disruptive Technology Director at Elsevier Labs. 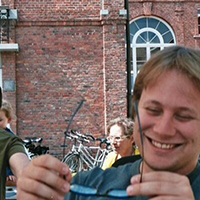 He holds a Ph.D. in Computer Science from the University of Southampton (2007) and has done research at the University of Southern California and the Vrije Universiteit Amsterdam. His research focuses on dealing with large amounts of diverse contextualized knowledge with a particular focus on the web and science applications. This includes research in data provenance, data science, data integration and knowledge sharing. He led architecture development for the Open PHACTS drug discovery data integration platform. Paul was co-chair of the W3C Provenance Working Group that created a standard for provenance interchange. He is co-author of Provenance: an Introduction to PROV as well as The Semantic Web Primer: 3rd Edition. He has authored numerous academic articles. You can find him on the web at pgroth.com and on Twitter @pgroth. The presentation given at EDF 2016 can be found here, and can be watched in full length here.